Last week started out well. But by the end of the week, I was floundering around, confused and distressed by a challenge I’d never faced before. One morning, upon awakening, I noticed I could not hear out of my left ear. No sound at all. My right ear wasn’t much better, though I could at least talk on the phone. I called my doctor, whom I rarely visit. After describing the problem to his nurse, she said it was probably nothing serious. But she wanted me to come in a couple days later. Which I did. As she had said, it was not serious, and the problem was quickly resolved. In the meantime, I could barely hear. I live out in the middle of nowhere. We don’t have a lot of noise, from any source. But there’s enough to notice. It was eerie—all that silence, not being able to hear even the little noise we do have. Finally I resigned myself to it, and actually started enjoying the silence. I turned that time into sort of a waking meditation. It was pretty powerful. I found a new dimension of life. New to me, at least. I found a solace or peace you can find only when you are silent and still. Here are two short videos. In the first, The Power of Silence, psychiatrist Judith Orloff talks about the benefits of silence. The second video, Caress My Spirit, takes you on a peaceful stroll into nature, with soothing background music. Enjoy the silence! 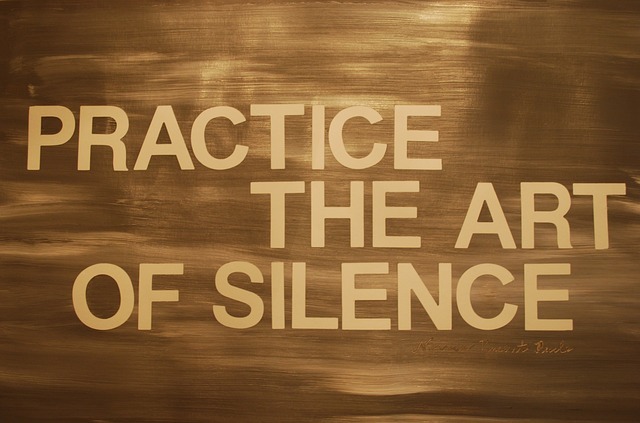 Do you allow yourself to enjoy a bit of silence every day? How? Please share your thoughts and comments with us below. Thank you. Yes this combined with some authentic being together with others makes my days nourishing. PS, I found what I was looking for courtesy the first related link and it was from the video by Eckhalt Tolle about listening to the silence behind the noise. I have been practising this on my walj to work with the roar of cars whizzing by and it’s true there is always background silence to tune into. However, it was most noticeable (or maybe more noticeable for the contrast) when we had a day out to Macclesfield Forest. The silence, despite bird song was palpable and heavenly. We drank it up as if we could bottle it. Thanks very much, Margaret. The silence and stillness of nature are the most powerful for me. That was marvellous how you turned a difficult situation into a meditation. Thank you for this. I live in a noisey city near a main road and the airport but thanks to one of your earlier blogs I am learning to listen to the silence in the midst of the noise. I would love to revisit that blog but not sure how to find it.Do you.know which one I mean? So glad you have your hearing back again. Thank you very much, Margaret. It took me a few hours before I accepted the situation, and then I felt peaceful. I used to live in a noisy city — so I completely understand your situation. If you can’t find what you’re looking for in one of those 3 posts, let me know and I’ll do some searching. Winter,in the middle of my ex mother in law’s farm fields. That was my first experience of lack of noise. Just utter silence, save for my heart beating. Next was 24 years later in the Northwoods of Wisconsin. Night time no noise. My hearing must be somewhat diminished because I no longer hear my heartbeat in the silence. Now 17 years later, just sitting in my mother’s living room with her and settling into the silence. So calming. I sent this blog & 2 videos to my sisters because we have finally after 7 years got my mother to get a hearing test, and next week set up for hearing aides. Its dangerous because she didn’t hear my father yelling for help the other night. Its also sad because one of my sister’s channeled that my mother enjoys her silence. Its become very meditative for her over the years. Your post is funny in its timing because I literally opened it just after returning from taking my 92 year old mom to the hearing test. It was the perfect message to send to my two sisters, and four brothers. We may have a victory in getting her to get the aides, however she has been in this richness of silence. So we are not necessarily enhancing her quality of life (her & my Dad’s safety yes.). Of course she & we all know she doesn’t have to wear them. Thank you for your perfect timing. How we all weave together is always amazing to me. Thanks very much for sharing your experiences, Margaret. I’m delighted our post was timely for you. Spirit works in wondrous ways! Thanks very much! Actually there was nothing wrong with my ears — just a bit of wax. My hearing is fine now. I appreciate your concern. That’s great that your father is so healthy at that age — what a great role model for all of us! I agree with you about the beauty, peace, and love that can fill the silence. In fact, the closest I’ve ever felt to those I love is when we’re together without having to say anything. I think that’s when we feel the love most powerfully, in the midst of silence. Lots of love to you, Cathy!